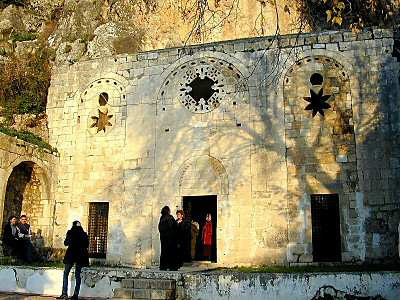 Image: St. Peter's Cave Church near the site of ancient Antioch. It was built by Crusaders c. 1100, on a mountainside cave site where early Christian supposedly met, and restored in the nineteenth century. A new episode is posted to the series on Eusebius of Caesarea’s The Ecclesiastical History: book 2, chapter 3 (listen here). Eusebius indeed sees the triumph of Christianity reaching to the planting of churches in every city and village and with these churches “crowded with thousands of men.” One wonders, however, at this very positive assessment in the early fourth century when Christians were still in the minority in the empire, when many areas were not evangelized, and when paganism still had life and strength. He sees Christianity as moving men from idolatry and polytheism to monotheism, and from irrational to rational worship. The emphasis is on the reasonableness of the faith and the inevitability of its spread. He draws on Acts 10-11 to note the conversion of Cornelius under Peter and the rise of the church at Antioch under the teaching of Barnabas and Paul, as well as the prophesying of Agabus from Jerusalem (Acts 11:27-28). He notes that the followers of Jesus were first called “Christians” in Antioch (Acts 11:26). Eusebius expresses what could be called a confident and triumphalistic view of Christianity.